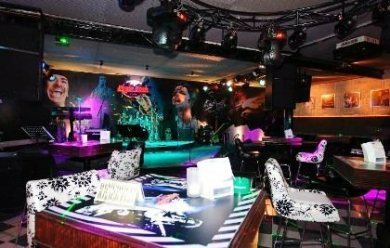 Since its opening in November 2009, this rock bar is becoming increasingly popular with the youngsters. Many tourists have started visiting the bar as well. It's located at the Resorts World Langkawi (formerly known as Awana Porto Malai Resort) at the south western tip in Pantai Tengah. What's so special about this bar? It's probably the vibe and also the location. The bar has an outside area that faces a Broadway and the lagoon offering a wonderful view of the water and sunset. And inside, the DJs and the live bands play hard rock until the wee hours. If you just stand at the back facing the giant screen below which the live band performs, you will only see hundreds of heads shaking to the rhythm of the music in front of you. The drinks list is extensive and includes cocktails, martini, margarita, a range of beer, wine, rum, vodka, whiskey, Champagne, aperitif, tequila and lot more. In fact the bar boats of stocking some of the widest range of drinks in the island. No wonder it's so popular with the locals and catching up even with tourists. They have a number of promotional offers that continues throughout the year. Happy hour is from 4pm to 8pm. During happy hour you get one free draught beer with each one you buy. Every Wednesday is called "Cocktail Night" and you get one free cocktail with each one you order. On every Sunday, there is a 50% discount offered all night long, any many more such promotional offers. The food menu is essentially pub fare. Some of the great dishes we like here are grilled beef tenderloin, creamy pesto shrimp linguine, beef burger etc. Other dishes include Thai fried rice (doesn't really go with the vibe here), crab sticks, spring rolls, chips & salsa etc. This is an upscale bar. A beef burger would cost around RM28 and a small Heineken beer about RM15. So watch out your pocket. Eagle Cafe also sells souvenirs like T-shirts, caps and wallets with the cafe logo imprinted on them. Daily from 4pm till late hours.